The 23rd Classic Marathon effectively started at Portsmouth harbour when the cars taking the ferry to Bilbao were scrutineered. Even at this early stage there was drama – a Lotus Cortina was overheating whilst in the “big” Healey the navigator trod on the fire extinguisher setting off clouds of powder in and around the car. 30 cars started from Santander; by the time we reached Ovideo six days later there were 24 still running, 3 of which were stranded at the foot of the results table after breaking down. Even though this was Regularity rally it was still tough on the cars. 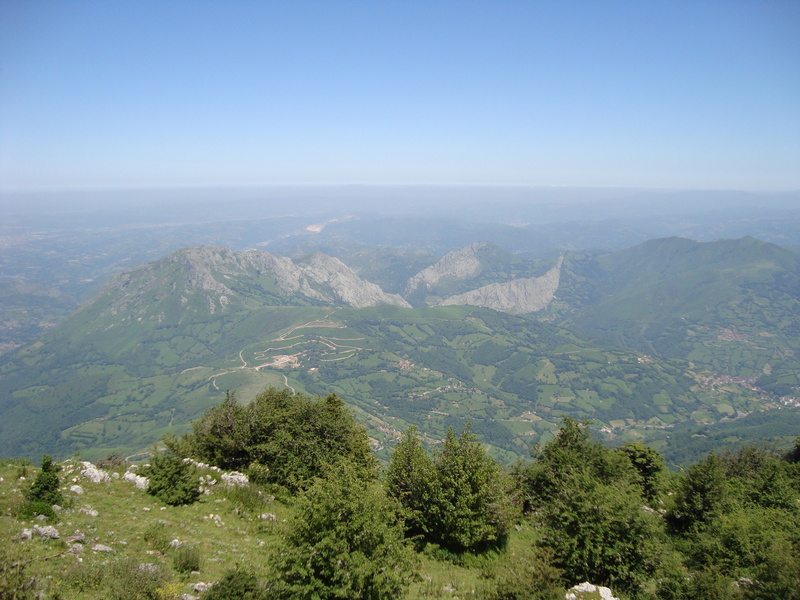 The route took us in the mountains from Santander in the east to Cabo Finisterra in the west and every day was up and down along narrow winding roads. 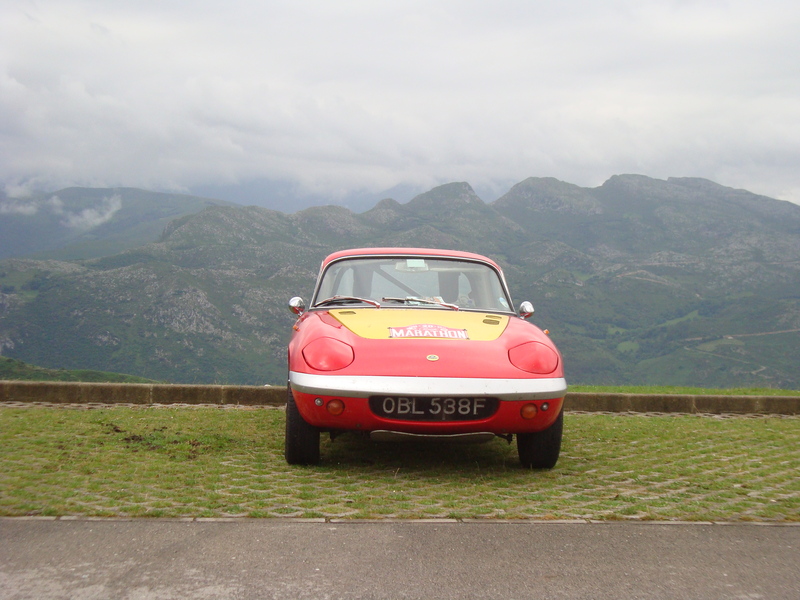 We were due to be accompanied by an Elan Sprint – but he transformed into a Scimitar after the clutch forks broke – and what did we do two weeks before the rally? Had the engine out to replace a seized clutch release bearing – one of many co-incidences, which characterised this rally. After the Picos mountains, the first day ended at the seaside resort of Ribedesella and the mechanics already had the head off the unfortunate Cortina which broke down irretrievably during one of the regularity sections next day. At dinner, Paul and Roma in an MGB were convinced they had come across us before – they had, in Puerto Natales in Chile in March 2010 when we were replacing a trunnion! Having spoken to us then they decided rallying was for them……and there they were! Day 2 took us through the Asturian mountains and out of the woods to the high arid plains where we spent most of the day at an altitude of over 1000m. 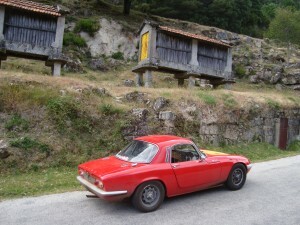 At the overnight hotel another cylinder head was off – this time from an Alfa – but he did finish! We felt the need to check our diff oil level but all was well. 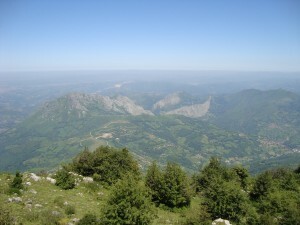 The third day includes what the organisers describe as “exploring interesting farm lanes”. Translated this means they are narrow winding lanes with lots of unlikely turns which you should go down and plenty of more likely looking turns you should not! The last regularity of the day saw cars flying in all directions and having got to the first (of 3) controls fairly respectably we lost the plot (and the route). Having given up all hope and heading straight to the hotel we saw three rally cars stream across our path at a junction and followed them to the final control. 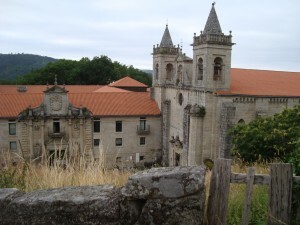 Our hotel was another Parador – a chain of hotels in magnificent old buildings – this one at the monastery of St Estevo which dates from the 7th century and boasts three cloisters, sturdy granite stairs and an idyllic location on the tree covered slopes of the Sil valley. What better place to replace our points which were yet again playing up? We thought this problem was cracked when we replaced the distributor and had 6,500 trouble free miles in Patagonia – it seems not. Day 4 included a forest fire but before that we passed a crashed BMW (went straight ahead when the road bent to the right) and saw the Atlantic Ocean. Lunches were a feature of this rally with far more than we wanted to eat; the hour’s break is meant to bring a calming civilisation to the crews but we just wanted a pitstop and off! This was in a luxury hotel with shaded gardens and tranquil lakes – just the place to savour the wine which accompanied every meal – except that Spanish drink drive laws are very strict! The evening’s task was the remove the sump guard to fix the vacuuum T piece which had split giving no headlights, reduced power and too much unfiltered air into the engine. Next day was not good! The car really didn’t like the “special tests” which the organisers arranged – generally a couple of laps round a karting circuit. This test included a “stop in the box” halfway round. The car stopped fine, stalled and had to be pushed away so we missed the second lap completely and got maximum time penalties for the incomplete first lap. The mechanics arrived, poked and prodded – and she started quite happily without any problem. This cost us 7 minutes, one place and a class medal (ok it would only have been third!) and we ended up as the only car which finished and did not receive a trophy. The last day ended with a hillclimb regularity up to an altitude of 1570m and a number of hot and bothered cars, including the Elan which again decided that after stalling on the finish line it was going to chose its own time to restart. 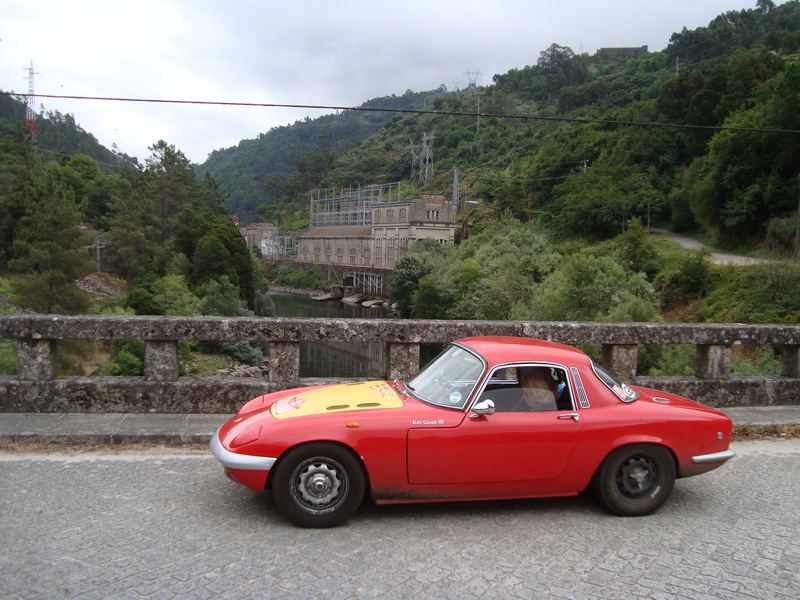 The rally was just over 2000km – but we were only part through our trip as we wanted to visit Portugal – deciding that Evora was too far away………..
Our first stop was Braganza where we visited the old walled town and castle. 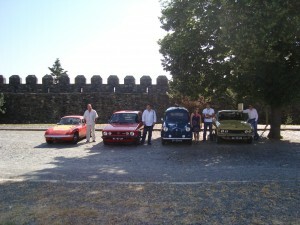 Leaving town next morning we wanted a photo-opportunity outside the castle – and found the local car club were having their summer Meet & BBQ there – not sure who was most surprised when we rolled up! We knew we had a long day ahead so did not stay; the day turned out to be longer than expected with the roads much slower and roadworks occupying most of the motorway. 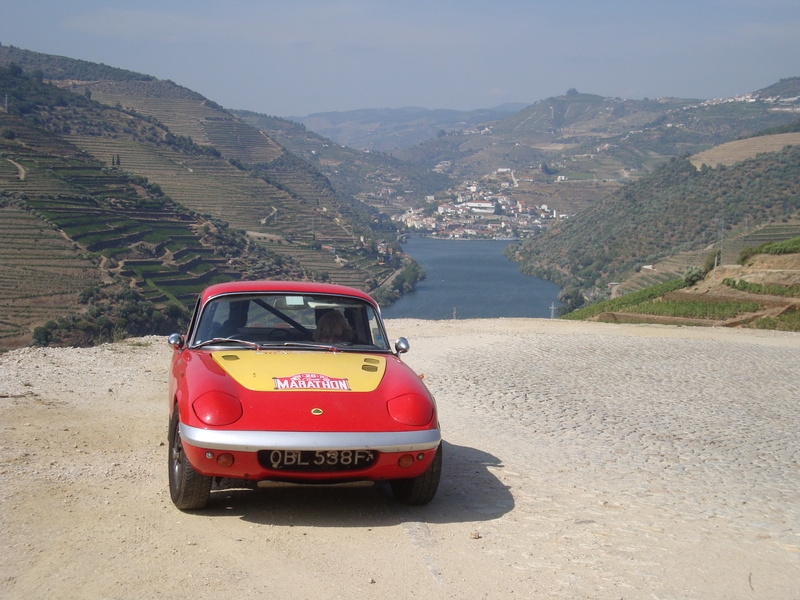 After the warmth of Braganza we found rain and cloud at the start of our tour round the port wine region of the Douro valley. The day brightened up and glorious sunshine accompanied our drive round the wine terraces. Our next stop was Porto where we found the signposting even worse than we had experienced so far and the driving standard awful with no leeway being granted to a car that was clearly old and lost. Leaving the city we headed for the hills and the iron age city at Briteiros followed by the religious extravaganza at Bom Jesus where to our great surprise we bumped into Andrew and Sarah in the Porsche 914 from the rally – if we’d arranged to meet them here we’d certainly have failed! 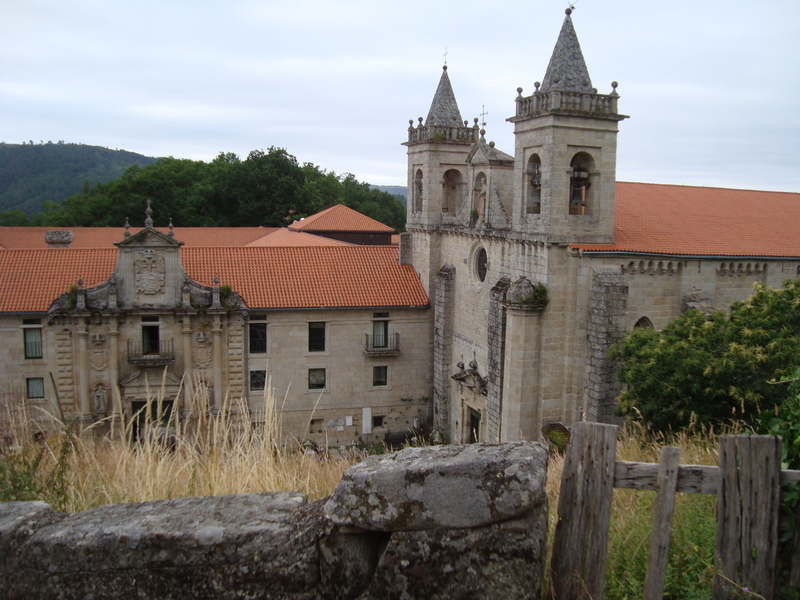 Bom Jesus is more or less replicated in the nearby Santuario de Sierra da Pineda and one can but wonder at the effort spent on creating these edifices. 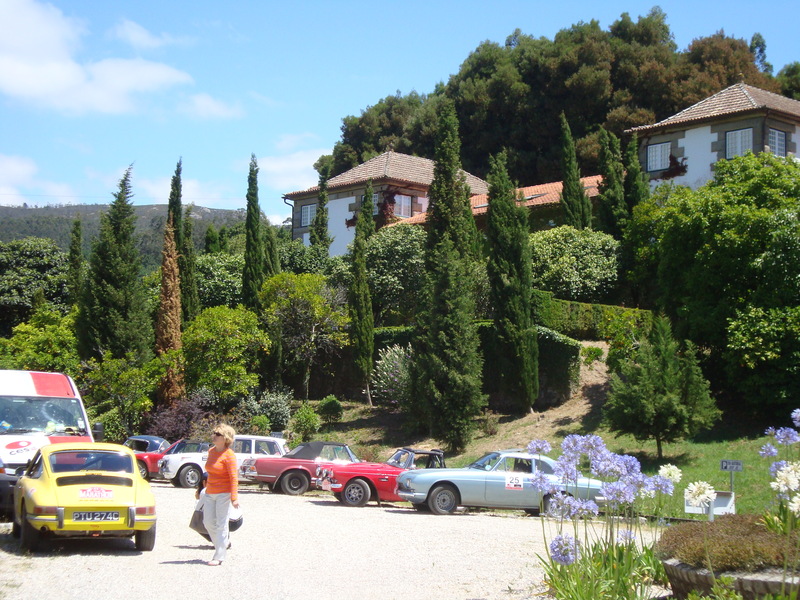 We left Portugal in the direction of Ourense and this time were able to take some pictures of the countryside as we reached what had been rally territory. Although most definitely not a race there was little time to spare on this rally and we took many fewer photos than usual. A long drive along the motorways past Leon brought us closer to the coast when another problem arrived – stopping for petrol the starter motor ground slowly round and the car just started. Surely the battery hadn’t failed? Thoughts turned to the regulator box but it seemed to be operating correctly and the contacts were moving as the engine revs rose. I had a spare but was reluctant to swop them over. We stopped at an expensive hotel with private parking and found the culprit – the starter motor end plate had come loose with 3 of 4 screws missing. I don’t carry spare screws but fortunately the bolts from the large size “chocolate blocks” were a good enough match – starter motor purred! This entry was posted on September 5, 2011, 7:59 pm and is filed under 23rd Classic Marathon. You can follow any responses to this entry through RSS 2.0. Both comments and pings are currently closed.